You’re invited to the first Disneyland After Dark after-hours party taking place in Disney California Adventure Park—where Super Heroes assemble! This separately ticketed evening event immerses you in the past, present and future of some of your favorite Super Heroes. Encounter Characters from across the universe, delight in specially themed treats, have your photo taken against backdrops that are out of this world, rock out on the dance floor, ride popular attractions with little wait times and more. Purchase of a special event ticket is required to attend this thrilling event that takes place at Disney California Adventure Park on April 30, 2019 or May 1, 2019. The party is from 9:00 PM to 1:00 AM and includes admission to Disney California Adventure Park starting at 6:00 PM. The ticket price is $109 per person and is for one event date. Heroic Character Encounters: Mix, mingle and meet ‘n’ greet many of the most-feared crime fighters as well as Mickey and Pals who’ll be dressed in their Super Hero best! Hard-Hitting Entertainment: Dare to let loose at a dance party with amazing show moments you’ll never forget! Supreme Scavenger Hunt: Search for hidden artifacts throughout the park, solve the puzzle and help save mankind from complete chaos! Embrace a Super Hero Pose: Have your picture taken against themed backdrops that will put you in hero mode. 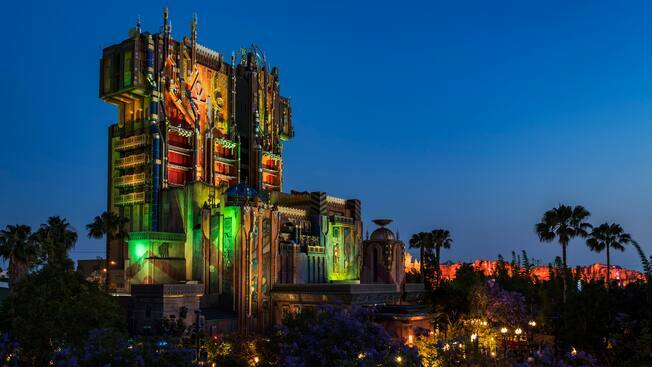 After-Hours Access to Attractions: Throughout the event, enjoy popular lands and attractions—including Guardians of the Galaxy – Mission: BREAKOUT!, Cars Land and Pixar Pier with less time waiting in line. Calling all Super Hero Cosplayers: Take cues from Mickey and Pals and break out those capes—see and be seen while cosplaying as your fave hero. (Costume guidelines must be followed.) Plus, limited-time Snapchat filters and event hashtags are great for pics posted on your social media feeds! Fearless Foods and Dynamic Merchandise: Purchase event-themed menu items at select locations throughout the park and shop a courageous collection of apparel, gifts and other goodies. Don your favorite costume* to an all new family-friendly Disney Halloween party where Oogie Boogie, from Tim Burton’s The Nightmare Before Christmas, has summoned the Disney Villains to Disney California Adventure Park for an unforgettable night of fun—part of Halloween Time at Disneyland Resort. See Villainous! a new World of Color show (exclusive to this event), experience the wickedly transformed Redwood Creek Challenge Trail, walk along immersive treat trails featuring Disney Villains and join a pulsing dance party with the greatest dance crew from the Isle of the Lost—based on Disney’s Descendants movies. This party is appropriate for children of all ages and is held on 20 spook-tacular nights in September and October, on Tuesdays, Thursdays and Sundays from 6:00 PM to 11:00 PM. Purchase of a separate event admission ticket is required to attend. The ticket for this event also includes admission to Disney California Adventure Park 3 hours before the party begins on Tuesdays and Thursday (excluding October 29 and 31, 2019) and 4 hours before the party begins on Sundays, plus October 29 and 31, 2019. Villainous! – Watch an all-new nighttime spectacular exclusive to Oogie Boogie Bash – A Disney Halloween Party (weather permitting). Presented on Paradise Bay, the show employs a full array of fountains, lighting, lasers, projections and special effects. Redwood Creek Challenge Trail – Experience the world of Disney Villains as you explore this trail transformed into a dreamlike environment through special lighting, projection and sound. Immersive Treat Trails – Make your way through wonderfully wicked treat trails while listening to eerie music and collecting treats as Disney Villains sit on their thrones. Trick-or-Treating – Collect goodies from illuminated and bewitching candy cauldrons. DescenDance – In the Backlot area of Hollywood Land, join a pulsing dance party with the greatest dance crew from the Isle of the Lost—based on Disney’s Descendants movies. Throw down your moves on the dance floor and learn new ones set to the biggest hit songs from the films. Frightfully Fun Parade – All the “boos and ghouls” are invited to gather for chills and thrills! Don’t miss this spirited Halloween parade where you can see Mickey and his pals marching in masquerade, Disney Villains, stars from the Haunted Mansion and more. Mickey’s Trick & Treat – At the Disney Theater in Hollywood Land, join Mickey and pals for a show about a Halloween party thrown by one of their friends, who gets everyone involved in the telling of the story. Character Encounters – Look out for popular Disney pals and legendary Disney Villains. Carthay Entrance Statement – In the spirit of Tim Burton’s The Nightmare Before Christmas, look for bats swarming, green energy pulses and spellbinding moments transforming the iconic Carthay tower structure. And lots more excitement for little tikes of all ages! Costumes may not reach or drag on the ground (e.g., full-length Princess dresses). While we encourage creativity, we also value safety and good judgment. The above rules apply only during the hours of the event. Standard Theme Park attire rules apply during all other times, and Guests ages 14 and older may not wear costumes in Disneyland Park on the day of the event or in Disney California Adventure Park if entering before the commencement of the event. Please note: all rules, regulations and guidelines are subject to change without notice. Event elements including, but not limited to, operation of attractions, experiences, entertainment, characters, special offerings and services are subject to restrictions, change or cancellation without notice. No refunds given for any such changes or cancellations whether due to inclement weather or otherwise. The number of tickets available are limited and valid only for the specific event date and hours. Limit eight (8) tickets per person, per event date. Tickets not required for Guests ages 2 and under. Tickets are non-refundable and may not be resold or transferred for a commercial purpose. Subject to restrictions, change or cancellation without notice. * The number of tickets available is limited. Events may sell out early. Online purchase is not available on the day of the event. Tickets are valid only during specific event dates and hours. Entertainment, ticket types, entitlements and prices subject to change without notice. Tickets may not be resold. Tickets are non-transferable and non-refundable. You’re invited to the first Disneyland After Dark after-hours party taking place in Disney California Adventure Park—where Super Heroes assemble! At this separately ticketed evening event, Disney California Adventure Park stays open for 4 hours after the park closes to other Guests and the party immerses you into the past, present and future of some of your favorite Super Heroes. Encounter Characters from across the universe, enjoy photo opportunities that are out of this world, dance all night, ride popular attractions with little wait times and more. The spell is cast! 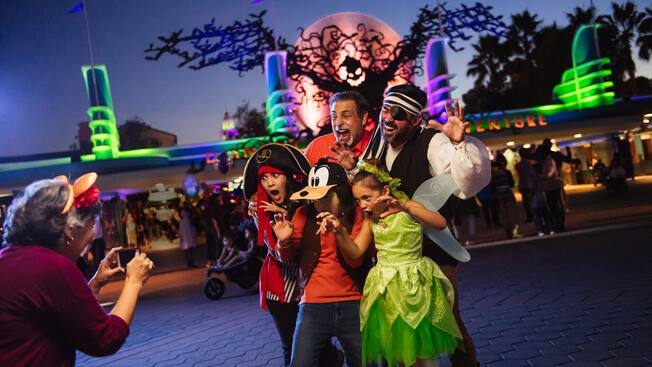 Join us for a new family-friendly Disney Halloween party where Oogie Boogie, from Tim Burton’s The Nightmare Before Christmas, has summoned the Disney Villains to Disney California Adventure Park for an unforgettable night of fun. See Villainous!, a new World of Color show (exclusive to this event), experience the wickedly transformed Redwood Creek Challenge Trail, walk along immersive treat trails featuring Disney Villains and join a pulsing dance party with the greatest dance crew from the Isle of the Lost—based on Disney’s Descendants movies. Purchase of a separate event admission ticket is required to attend. Tickets may sell out quickly for this event. Get yours before they disappear! Passholder tickets are on sale now, so be sure to sign in! Tickets for the general public go on sale April 30, 2019. Tickets will be available closer to the event dates. Please check back.